WikimediaA glass and bottle of 12 year old Suntory Single Malt Whisky ‘Yamazaki’. 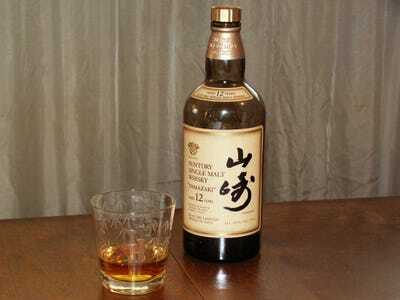 A Japanese whiskey is the best in the world, according to one of the top industry guides. The 2015 edition of Jim Murray’s Whiskey Bible gave the crown to the Yamazaki Single Malt Sherry Cask 2013. The bible will be published next week. Scottish liquor did not feature in the top five, according to the Daily Mail, which got an advanced copy of the guide. The title of best European whiskey went to English Whisky Company’s Chapter 14 Not Peated. He writes: ‘Where were the blends which offered bewildering layers of depth? ‘Where were the malts which took you on hair-standing journeys through dank and dingy warehouses? ‘Some have taken their eye off the ball and not brought into account the changes which have altered the face of whisky. Murray sampled 4,700 varieties of whiskey for his bible.